What was yesterday’s mysterious Ear Wax/Fry Bread challenge? Tetragonisca angustula, the "Jataí" bee, is one of the few non-Apis bee species cultivated for honey production. Nests have a characteristic wax tube at the entrance. 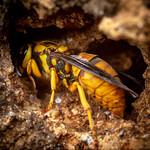 A Tetragonisca angustula stingless bee works wax at the nest entrance. As they should. 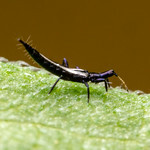 Tetragonisca are common, widely-recognized insects in South America. I even used to keep a colony on my porch when I lived in Paraguay. They produced a lovely watery honey. I think I’ve gotten better. Anyway. Next week’s challenge will be harder. I promise. not that this is uncommon – but the first shot there is a really captivating image – great lighting! Thanks, Brian! The light is a single diffused flash, held overhead and slightly behind. The titled kade me smile!